Chinese Roast Pork (Siu Yuk) - Save yourself a trip to Chinatown and use this easy recipe to make the crispiest and best Chinese roast pork at home. In my cookbook “Easy Chinese Recipes,” I have a Chinese roast pork belly recipe, or siu yuk. 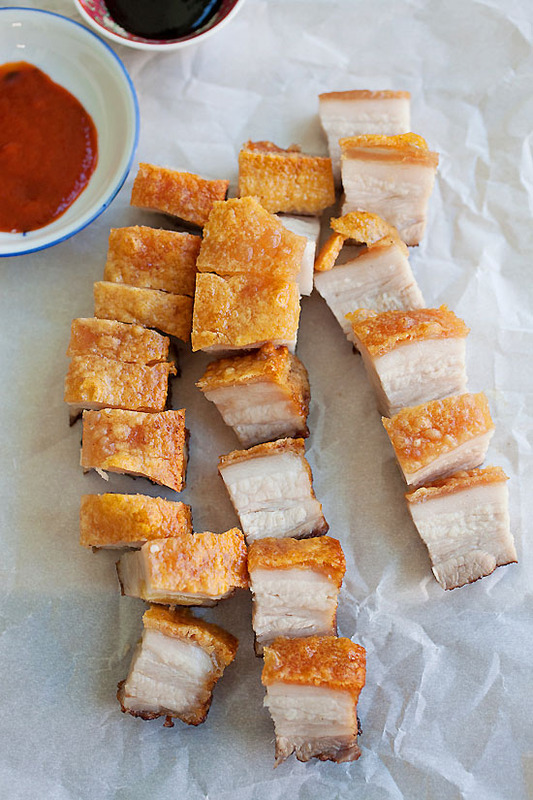 On Rasa Malaysia, I also have a crispy pork belly recipe, contributed by my dear friends at Eat A Duck I Must. Both recipes are great and excellent, but when it comes to Chinese Roast Pork, one could never have enough recipes. 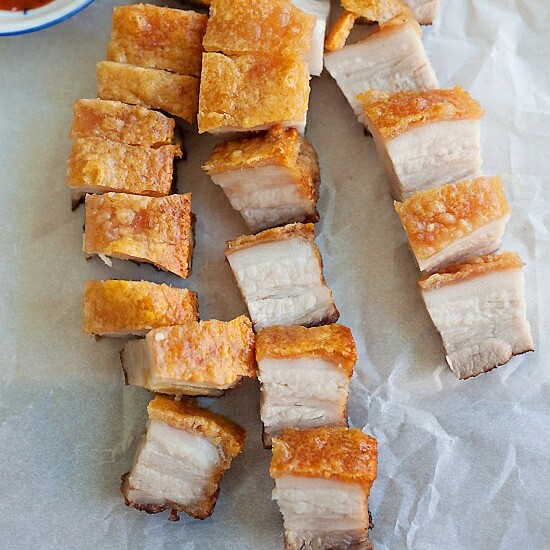 There is always that one PERFECT recipe that everyone is constantly looking for—easy, hassle-free, everyone-can-do-it kind of recipe that promises crispy, crunchy, absolutely aromatic and to-die-for pork crackling, melt-in-your-mouth Chinese roasted pork belly….ahhh, the thought of it sets my mouth watering. This Chinese Roast Pork recipe is from my good friend Robert Danhi’s Facebook page. Robert and his wife made the roast pork following a recipe gathered from a church in Kuala Lumpur, Malaysia. I had personally tried their creation during an event last year, so I decided to attempt it on my own. I have to say that this Chinese Roast Pork recipe is probably one of the easiest recipes around. 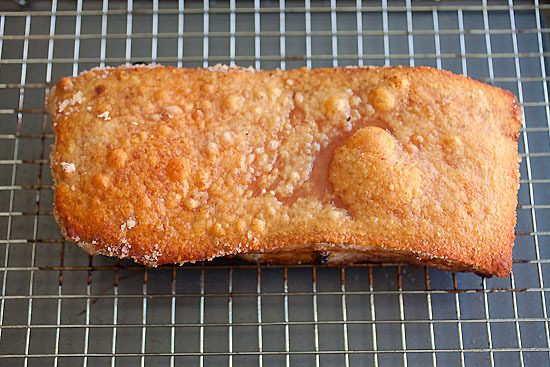 There is no need to poke the pork skin, no vinegar, no pre-boiling the pork belly. Just very simple and only few steps are involved and the result is almost guaranteed and fail-proof. I am all about easy recipes that makes Asian food accessible in any kitchen, and I strongly urge you to try this Chinese Roast Pork recipe. The end result, as you can see, is very crispy pork crackling. The pork belly is juicy and tender, with the melt-in-your-mouth pork fat, and the taste is a bit salty, aromatic (from the garlic and 5-spice powder). It’s delicious!! If you don’t believe it, browse through my photos as the images speak louder than words. Make some horizontal slits on the sides of the belly, then insert each garlic and push them deep in so they don't burn. Rub the meat side with the five spice powder. Then layer the top of the pork belly with the salt evenly. Place the pork belly on a wire rack, and place at the top 1/3 of the oven for 1 hour. While baking, the oil will drip to the bottom pan with water. Raise the heat of oven to 465f/240c, place the pork belly back in and roast for another 40 minutes. 10. Remove from oven and let set for 10 minutes. 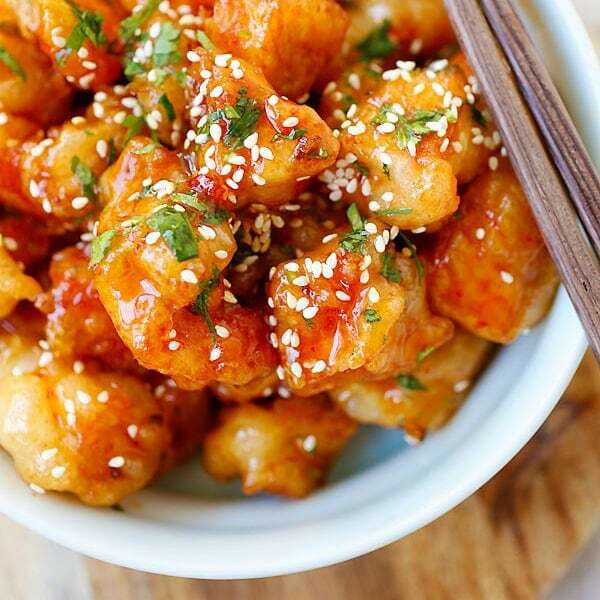 Cut and serve immediately with some chili sauce and hoisin sauce, or eat as is. Place the pork belly on a wire rack. 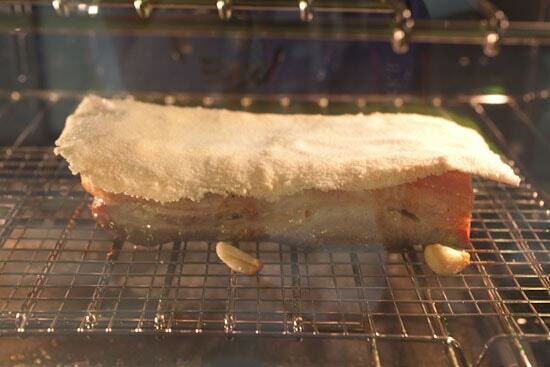 This is how the pork belly and salt crust look in the oven. You have to insert the garlic deep inside the horizontal slits or else they will be pushed out during the roasting process. Just a quick question about the salt….did you just use regular table salt or was it a flakier or bigger chunks of salt? Curious how the salt stays on as a crust if its just regular table salt? Thanks for any info! Oh Bee…… I have done a couple of times making Chinese Roast Pork ( Siu Yok ) , the recipe was given to me by a Chinese Roast Pork seller, and looking at your recipe I think you have missed out an important step in the preparation to get the crispiness of the skin :). Can you update this recipe please to your ‘die-hard’ followers-thank you! The method is what it is I didn’t miss any steps. There are many ways, scald the skin, poke holes, etc. This is the easiest method. Missed something………..how rude. I think it is amazing and so do all the people I have cooked it for. 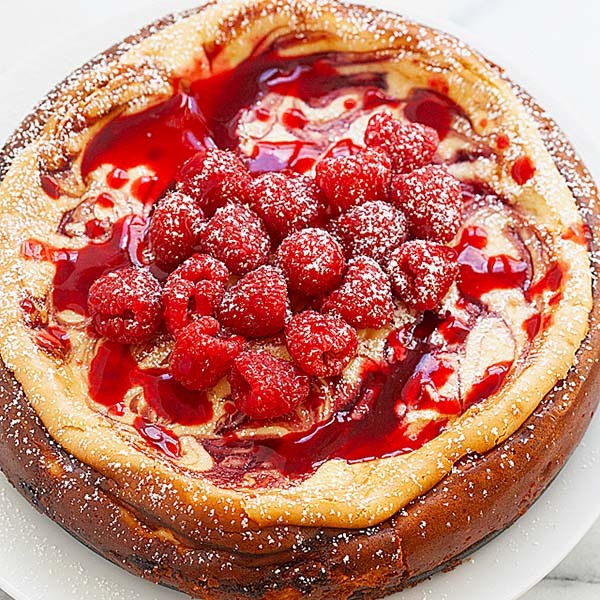 Keep your wonderful recipes coming, I really enjoy your site. Thank you. I used regular table salt. I couldn’t understand this step but I followed as written and it worked like a charm. The salt will sit on the skin and somehow will bake into a salt “cracker”. The skin and meat will shrink and the salt sort of protects the skin from becoming hard and burnt. The skin cooks perfectly. My chinese mother in law couldn’t belive that I, not chinese, could cook it the same as you would buy at the wet markets in Hong Kong. I always serve it with 60/40 golden syrup and black treacle, delicious! Wow, interesting idea. Thanks for sharing! Hi Bee, I couldn’t but pork belly with skin but want to try your recipe. So do i skip putting salt on top? Or iis it ok to follow all the steps through by layering the fat top with salt as you would on the skin part? And I notice that you don’t put foil wraps all around the meat like a pan, will it nor burn the sides of the meat during baking? If you have no skin, then you are not really making Chinese roast pork as the skin is what “makes” it roast pork, know what I mean. The fat part won’t get crispy even if you put salt. You can put a bit of salt for the salty flavor. Bee, would this work using a turbo broiler? You’d have to go to an Asian market, like 99 Ranch, SF (Shun Fat), or HK Market. I tried this recipe for the 2nd time (didn’t do it too well the first time) and it came out beautifully succulent on the inside and nice crackle on top. It is such an easy recipe and much prefer it to buying from the shops! I tried this recipe over the weekend and gotta say it is easy to make and clean up is a breeze; taste is also pretty good. The fat didn’t get rendered as much as frying so it feels heavier on the mouth. Is this your experience as well? Oh the crackling was really crispy, it’s so good that’s all you hear as you’re eating them =) I mean the fatty part of the pork belly didn’t get as rendered as when you fry it. 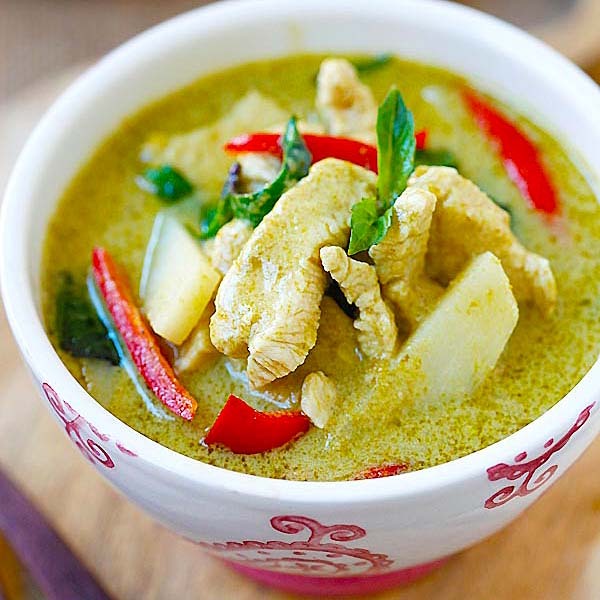 Awesome simple recipe … Loved it. Tried it once and it turns out rather well. I am impressed with my culinary skills … Lol … Thank you so much. LOL, glad that you nailed it. Maybe you over roasted it. … or your oven temp was quite right? Well. Was the case on my part. Irish/Korean Californian couple residing 2 hrs north of Toronto since beginning of the year and no real selection as far as good asian restaurants. It’s great that my husband loves all food but I love making the Californian faves. Yes temperature is correct. Thanks Linda for trying my recipe. I’m planning to make this dish for about 20 people tomorrow. I’m hosting a dinner at my friend’s apartment though, so I thought I would bake them in my oven first until the salt forms and then continue the last 40 mins baking at my friend’s apartment, do you think it will be okay? I’m afraid it will continue cooking as I drive to my friend’s place and become overcook. Also, another question, I saw some recipes using baking soda but you omit this step, will it give the same crispy result? I think should be OK no need baking soda the most important thing is the skin is very dry. The first couple of times I did and it turned out nicely. But now it keep failing. The skin doesn’t turn golden and crispy but dark and hard. I’m not sure what I did wrong. I do notice when I remove the salt, the skin look wet in some area. Any thoughts? Thanks! It means the skin is not dry, if they are not dry, it will fail. Hi. If I have a 2.5 lb pork belly to roast, how do I adjust the roasting time both for the salt hardening part and after removing it. Thanks! Hi can I use air fryer. Any adjustment on time & temperature needed. 6 cloves. By the way, I think pips and cloves are the same. Basically 6 cloves and not 6 head/bulks. Just to check, put a water pan at bottom 1/3 rack throughout. And also, the pork goes in and out always to the top 1/3 rack of the oven all the time? Is it ok if I prick holes at the top part? Do I need brush vinegar somewhere? Heard it tastes better with it. Thanks! You don’t have to do the vinegar and pricking holes if you follow the recipe exactly. Yes all goes to the top 1/3 rack. Is the water optional? Will the pork belly come out the same even if I don’t use water? Hi Bee, does the tray of water remain in the oven for the whole cooking process or is it removed when you take the pork out to remove the salt crust? Can’t wait to try this ? Leave it there all the time. Add more water to refill. Hi Bee, can I bake it with a halogen oven? What if I omit the garlic? Really look forward to trying this awesome dish! Not familiar with halogen oven. Why would you want to omit the garlic, it makes the roast pork aromatic and great. My oven has heating elements on top and bottom… Should I choose either one or have both working? How long does it takes for the salt crust to form? I don’t know, I haven’t tried it. I intend to make it tomorrow. 1 have an oven with top & bottom heat mode (for baking cakes) or grilling mode (for char siew). Which mode should I use? tku again. I think you need top heating…but maybe grilling might work, too. I don’t know for sure. followed the steps closely n WOW!… finally got it right! Cool Alwee glad you got the Chinese roast pork right now. the crispy crust doesn’t last…got to consume right away..
any steps to maintain the “crispyness”..
Hi Alwee, it’s probably because of humidity. Mine stay crusty for the whole day! Was wondering if I can marinade the meat with shaoxing wine and five spice powder and leave it overnight to marinade before cooking it the next day with the salt crust? Hi Bee, i just don’t know if I miss any steps here. Do you mix the salt with water or egg yolk to keep it sticks together, or just pour the salt right on top the pork? I’m afraid it would not stay. Let me know please, my pork is ready for the oven but i still don’t know how to keep the salt on. Just put on top as instructed, press them on if they don’t stay. After baking the salt forms into crust. Hi thanks for your great recipe. I have tried few roast pork recipes but no one works for me and I feel great Cox with ur recipe I’m now able to make my own roast pork and I want to say ur recipe is the easiest recipe for roast pork. No boil and complicated steps. All I changed is I put into fridge after marinate the meat to make the skin more dry just in case. Out of my surprised it’s came out perfectly with crispy crunchy top. Thank you! Hi Bee,.. I’ve tried making it once and the skin is really crispy. But I wonder why the pork taste rather salty even after removing the crust. Need you advise. Thank you! got the rind ‘biscuit crisp’, but it doesn’t stay and turn soft after maybe like a couple of hours later. wonder how can we maintain the crust? Hi, i have tried a similar recipe before using salt crust but i found that the salt crust is very diffcult to remove and some salt are sticking to the skin! any ideas why that would happen? was it because i didn’t bake the salt crust long enough? i normally tried to remove the salt after 45-50mins. Hi bee, I roasted for an hour at 180 degree but certain part of the salt crust stick on the skin even after removing the crust, any idea how it can be removed totally like your YouTube video? I baked mine the whole hour and it came off fine. I’d tied the pork w/ twine to hold the garlic in, so the salt stuck to the rope but the skin parts came off easily. I didn’t have high hopes as at the end of the cooking time the skin was dark and flaccid. That said, just 30 mins of blasting under the grill setting gave a lovely, even crisp finish which was light and oh-so crackly. Oh, and I omitted both the five spice and the garlic and ate it with cauliflower, apple sauce and gravy. When i click on the link to read the recipe, it says”page cannot be found”. Is there somewhere else i can get the recipe from. This looks delicious !! five spice powder was composed of any material? my pork belly has a thick tough skin on it above the fatty layer. Do i take this off and put the salt on the fatty layer or keep the skin on? The skin, turned into crackling in situ, is what makes this dish amazing. This recipe worked excellent. The salt turned into a crust that was easily removed. The skin crisped up perfectly. Made some crazy good Banh Mi tacos. My roast pork turned out perfect using a halogen oven. So easy n hassle free. The taste is to die for ….except I forgot the garlic! Thanks Bee for this awesome recipe. Hi, Angela. Can you please give me your duration and temperature to cook in a halogen oven? Are they different from the recipe here? Can you post a pic of what you mean “Make some horizontal slits on the sides of the belly, then insert each garlic and push them deep in so they don’t burn.” Sometimes pictures are better than words. Think of a horizon, the sunset, as horizontal…instead of up and down. Hi! I have a 2 pound pork belly…. 1) how long should I roast it for with the salt on top? And also roast at 350F? 2) and how long do I roast it for the 2nd part after taking salt layer off? And also roast at 465F? How do you get the skin to be so thin and smooth? When I do it, it gets super bubbly and it’s crispy but really hard. Hmmmm I am not sure…maybe you roast it a little shorter? Tried the recipe. Salt crust worked great. Garlic was rather too much. Skin was disappointing, crisped up well, but was very very hard. Next try I’ll likely reduce or eliminate the garlic (I don’t recall the sui yook I loved in Singapore being at all garlicky), and would welcome suggestions regarding making the crackling edible. Could you please send me a picture John? Won’t the salt make the skin a but too salty? I’ve tried this way before and I’m not sure if it was because the oven wasn’t hot enough or if it was too low on the rack? Give a try and u will love it … yummy and delicious ! Hi Bee, I tried this yesterday. Everything was good at the beginning but when I remove the salt and want to further roast at 240c, the skin just burned after 5 min. ?. Is the temperature too high? It shouldn’t be. Put it at bottom tray or cover it with aluminum foil so it doesn’t get burned. Turning the heat up to 240 makes the skin super crispy, you can cover with alunimum foil. Hi, what is the dipping sauce you do it with? Looks delicious! Was this recipe borrowed from the Legacy Cookbook published by various contributor for a fund raising event for church. Was permission sought please? Fairly – I am not sure, I didn’t see the book but I learned it from my chef friend Robert Danhi’s Facebook page. I gave the best credit I could and Robert credited it to a church cookbook. Hello Bee, is my first time posting. Have been receiving updates with great pictures. Am no good cook at all to a family of 5 but checking your recipes with simple steps and great pics seems possible to do it. Was thinking of making roast pork one day …as my friend said is simple and said she does it well but did not share! Finally, yours came in and am so delighted. Will try when I am on both feet again (femur fracture). Thanks again and keep sharing ! I was so exicted to make this recipe. It looked so easy and seemed to be great since I am watching my carbohydrate intake. I could just eat without sauce with no worries. 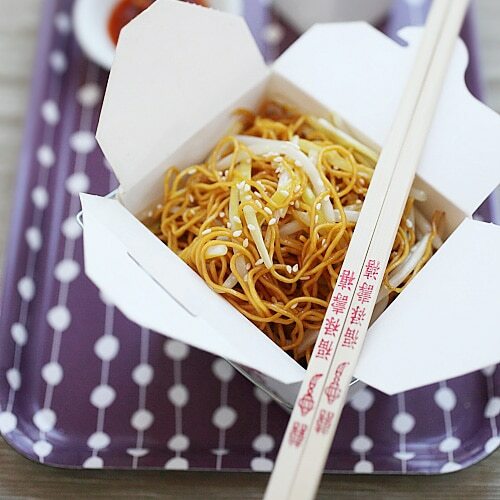 I never ate chinese five spice either and found that I liked it. It was almost sweet without the sugar. I enjoyed your pork recipe. My BF did not, I was so bummed and hurt Rasa. Thanks for making it easy and not overwhelming. Keep it coming!! what is the water for? To create steam in the oven. not too sure what i am cooking it does appear to form roast pork havent tried yet too hot. just exixting being able does it on tv.have exercise safety hence mo danger.its 10 pastb10 pm wed nite in houston texas.hi there where ever you are. Where can i buy 5 spiec powder? Hi Bee, thanks for the great recipe. Made this tonight and it was a hit! I was wondering… why is the salt needed? Thank you. Make the skin salty and also sucked the moisture or water out of the skin so it becomes crispy when on higher heat. I make this last night and it turned out spectacularly! came out almost perfect (pilot error — did not rotate half-way thru cooking on “Phase 2”). have one, small tweak. while the pork belly came to room temperature on the counter, i put a fan on high to make sure it was thoroughly dry. HI. Did you score the skin side of the pork belly? I tried this recipe and accomplished it perfectly. My question however is how do I keep the skin crispy for a long period of time or until the next day? Hmm, I think you will lose the crispiness for sure because of exposure to humidity, etc. Hi, I tried this recipe and mum simply loves it. She says I should make it for our family’s Chinese New Year gathering! After washing the pork, I dry the skin furiously with a hairdryer. It is difficult to get the skin crackling at times. Could it be the humidity, or I didn’t bake the skin with salt long enough? Also there is no rating for this recipe. I would like to give it 5 stars! I just made this. It was easy and delish!!! Thank you for sharing this recipe. It came out pretty just like your pictures and it tasted good! 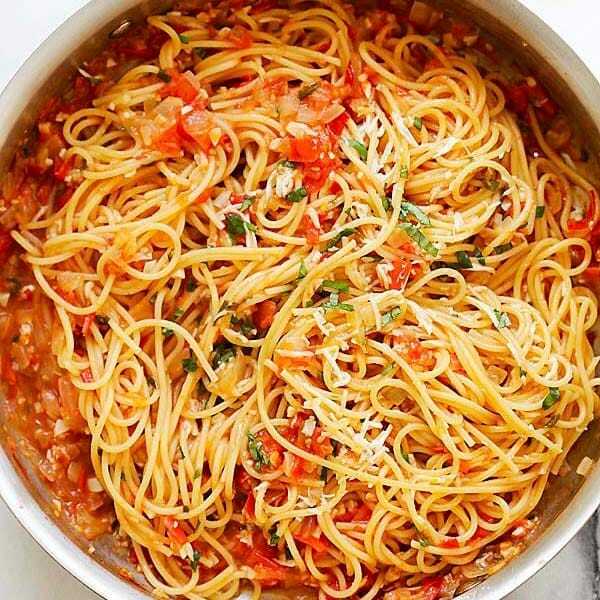 I absolutely love easy, simple, no fuss recipes. This is it! Thank you Bee! Thanks Vi, I am so happy that you had great success with this Chinese roast pork recipe. I took up the courage and tried the recipe with my new oven. The skin was not that crispy and I know I probably did not dry the skin enough. The flavor was yums and oh so juicy. However what troubled me most was the smoke, splatters and gunk splattered on the oven walls! How did you guys out there manage it? I spent hours cleaning everything up. I want to try again but I must figure out a less messy way if it exists. Thanks Bee for the recipe and video! Hi Pauline, LOL, yes it does get a little messy inside the oven. I travel frequently to the Philippine for work. I love the roast pork there. 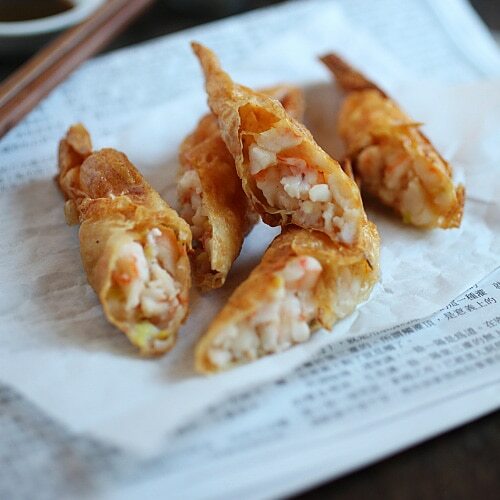 The skin is crispy but somehow it is different from the Chinese style I used to make. Recently, my new neighbour has a Filipino maid. One day , she did the roast pork. Here is the secret. She dried the pork ( skin side up) under hot sun for a couple of hour. She then roast the pork without the top layer of salt. It was crackling good. I tried it a few time myself and it was really good. The skin texture is different from the Chinese style. I love both styles. Bee’s recipe is simple and good. If you want more favour, add some red fermented bean curd (Nam Yee) and Chinese cooking wine. Season the meat in the fridge overnight ( sometime I leave it for 48 hours). The meat will be very tasty. It also make the skin very dry. Just before roasting, if the sun is hot, I put the meat under the hot sun to make sure the skin is super dry. The skin will crack very easily. Thanks for your tips! I will have to try your method. How did this other method turn out? Just tried this tonight, I have a convection oven so had to adjust temp and time but I found a web page that had a conversion for regular ovens to convection and it worked out well. I had to shorten the final round in the oven, I pulled it when it looked right and it had filled the oven with a fair amount of smoke. Was perfectly done. Very tasty, I had hoisin sauce and chiu chow chili oil for dipping. Just what I needed, a taste of real Chinese food, not Americanized. The smell when baking was just amazing. Delicious! Love this, tried it last night. Thank you. One question – do you leave the water in the bottom pan when you out the pork back for 40mins? I guess not as it wants to be as dry as possible, if you could let me know so i can perfect for next time. I tried this a couple of weeks back and given that was my first time using an oven, it was perfect. Easy and simple. And that crackling…marvellous! One question, if I use more pork belly, say more than 2lbs, do I increase the baking time proportionately for both steps? Thanks in advance! Just had this roast pork belly for dinner tonight. The skin was PERFECT. I followed the recipe exactly as written. The meat part was a little bland so next time I will try marinating or dry rub overnight. This is the easiest recipe I’ve found online that is so simple and still give great results on crispy skin. Thank you so much for sharing this recipe!!! 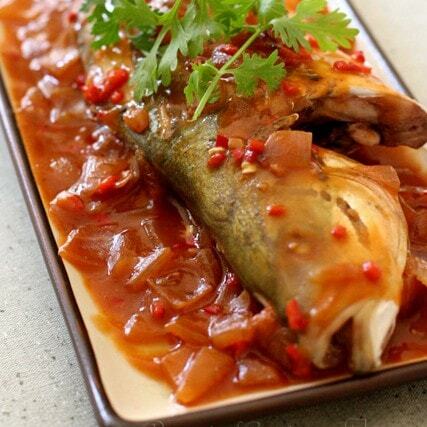 Hi, we tried making this siu yuk. Using coarse salt, but the salt stuck to the skin and was very difficult to remove the salt from the skin. At the end it was super salty but the skin was crispy. I live in Trinidad and can’t get five spices. what should I use? How can you not get five spice in Trinidad? Thank you for the wonderful recipe. It was really delicious, my family loves it ! Keep it up, Bee ! I am passionate about food loves to cook attended two Chinese school in Jamaica love to cook Chinese Food but did not get this receipt thanknow you very much.would love to get more info from you.Arlene Chang lives in Florida. Hi! If I was cooking double the portion (cooking two 2 lb cuts of pork belly side by side in the oven), how should I change the cooking times and temperature? Or should I use 4 lb cut instead? Thanks! i hardly write comments on recipes i find online but i really need to for this one. there are many other recipes with baking soda/vinegar, pre boiling or letting meat sit in the fridge overnight but its not necessary. this crackling came out PERFECT. everyone raved about it at christmas lunch!! the supermarket sold pork belly with its skin and fat already scored, i tied twine around the top portion of the pork belly to maintain its shape (otherwise it will fan out) and also not let the salt crust leech into the meat below. i doubled the recipe easy (2kg of pork belly) and added ginger powder and white pepper to the spice mix and it worked really well (inspired by another recipe online). used only 1.5c of coarse salt for my doubled recipe. i tried to pack it on, but a small portion of the sides kept falling off – its ok. turned out well. i think as long as you have liberal amounts of salt on the skin it will dry out the skin enough to produce the great crackling. Hi! Thought I’d share some information over here since reading the other reviews helped me get this dish right. I was really worried I’d fail because I didn’t have a big enough wire rack. I used my oven’s grill tray, the kind that’s got a groove running right along the bottom parameter and the middle raised so the oil collects in the groove. Not sure if these are the right terms but it’s the way I’d describe it. This means none of my fat dripped into the bath. So I put my enormous slab of pork belly in and followed the instructions. Thing was, my pork belly was really huge, so it overcrowded the top third of my oven, and it leant to one side so only one vertical half of the skin was crispy-looking. After an hour in the oven I took it out before I proceed to the ‘cook in 240 deg C’ step so as to adjust the position of the pork. I put the oven on preheat (to 240 deg C), took a small-ish wire rack to prop up the side of the meat, and because it was still falling over my husband jammed a fork in the meat and let the handle rest between the wires of the rack, effectively forming a lever that made the meat stay up. We put it in again for the prescribed 40 minutes, this time in the second third of the oven, right above the bath. Our pork belly was touching the ceiling of the oven in the top third, so I decided second would be better. I was so worried that the non-crispy half of the skin wasn’t going to cook, or that the proximity to the bath would ruin everything, but it didn’t! It still came out beautifully! This means, if you don’t have a wire rack, or if you decided to put the meat lower (at least, after the first hour), your roast pork would still turn out awesome. Thanks Lydia for your very insightful comment. Chinese roast pork is a favorite in our house I love how easy this sounds and this looks like something my family will love!Thanks a ton for the recipe. This works exactly as described! Perfect recipe! Served with rice and stir fried baby Bok Choy with garlic and onion. Hi Paul, sounds like a great meal. I am so happy that you like this Chinese Roast Pork recipe. I had a first go at this tonight and it turned out great! I had a little less pork belly than the recipe called for so I tried to improvise on the spices and the time. I got the salt crust just like the recipe said. I might have overcooked the pork just a smidge after removing the salt though. The skin was a little tough but could still eat it. Flavor was great and the meat/fat was perfect! Knowing how good and easy this is, I will get a larger cut of pork belly. I had 1.5 lbs on this go. Thanks Mike for trying my Chinese roast pork recipe. A little bit curious, if I use 1 lbs instead of 2 lbs pork belly, do i need to cut half of the cooking time or just go as the recipe? Tried it this CNY. At the end of baking, the pork skin didn’t have that bubbly effect, so I baked it longer than what was recommended in the recipe. My pork turns out tough — perhaps I overbaked it. I feel like trying again, but 2 lbs of pork is a bit too much to repeat. Can I halve this recipe? Do I have to change the time or temperature if I do so? Hi Jimmy, I am not sure why your roast pork didn’t bubble, I think it’s not dry enough? Did you buy the salt like the video? You don’t have to change time or temperature if you half the recipe. Can I use a pork rack instead of belly for this? How will this change the cooking time? I think you can, but the reason Chinese roast pork has to be pork belly is because of the crispy and bubbly skin. Does pork rack has skin? I break mine up and use it to kill weeds, just don’t put it anywhere you want plants to grow. Thank you so much! My roast pork turned out so amazing!! I used different spices (because I didn’t have five spice and the groceries weren’t open) but your methodology was perfect! Going to recommend this to all my friends! And invite people over for dinner more open? Awesome, thanks for trying my Chinese roast pork recipe. Very simple recipe to follow and the first try i got the skin crispy and meat moist! Kids and hubby love it! Thank you! Thanks Betty for trying out my Chinese roast pork recipe. I have a query.. As my traditional oven setting is to lit up the fire from either the bottom or the top part of the oven, I cannot turn on both the top and the bottom part of the oven at the same time. Does it matter? Should I just use the normal (fire from bottom rack)? Thanks! You can try. But you want your skin to bubble though. Sorry not familiar with your oven. I made this yesterday. The skin was tasty and crispy. However, the pork was so bland and tasteless even with the 5 spices. Will not make this again. Did you use enough salt? The pork is not supposed to have a lot of taste, that’s why you dip with Hoisin sauce. Hi, I tried this recipe and it turned out so wonderfully delicious, however the second time, the salt crust separated from the pork skin during baking and some parts didn’t turn out crispy, would you know how I can make sure the salt stays on the skin? Thank you! Btw, I have dried many of your recipes and I love them! Make sure you press the salt on the skin so it sticks. Hi, how long does it take for your salt crust to form if cooking a 2lb pork belly. Hi Rasa, What temperature for the initial hour? Thanks for trying this Chinese roast pork recipe.